It’s the toughest job any ANC president in its long history has had to do, but of all the presidents it has had, Matamela Cyril Ramaphosa is probably the best equipped to do it. The election of the ANC’s top six yesterday could in a strange way turn out to be a win for the country and for opposition parties. Ramaphosa will help to restore some market confidence in the economy and go some way towards pulling us back from fiscal populism and state capture, but with Ace Magashule as secretary general the ANC is unlikely to revive organisationally in the less than eighteen months before the 2019 general election. No, let me rephrase that. The results were a massive win for South Africa in the sense that it represents the second to last nail in Jacob Zuma’s coffin. The video of Zuma’s face as Ramaphosa’s win was announced that was shot by ENCA reporter Nickolaus Bauer and quickly went viral said it all: it was a stake in his heart and he knew that the end – to his political power and perhaps also his personal freedom – was nigh. Just a day earlier Zuma talked confidently about why “the number 10 loves me” – ten years on Robben Island and ten years as president. It won’t be ten years as president. Despite the election of Magashule and David Mabuza (deputy president), two of the most corrupt politicians in the country, I’m confident to state that Zuma will leave office next year, probably early in the year, and that Ramaphosa will then become president of South Africa. The defeat of Zuma’s preferred candidate, Nkosazana Dlamini-Zuma, by his worst enemy was the bullet that finally pierced the famous Zuma armour. Mabuza is a slippery, ambitious man with future presidential dreams. He will go with what serves his own ends and as a shrewd operator he must know that Zuma is yesterday’s man. Magashule and his family still have vested interests with the Gupta family and will be Ramaphosa’s toughest problem. But then, Ramaphosa has the support of the wily Gwede Mantashe (chairperson) and influential Paul Mashatile (treasurer general) in the top six. With Zuma now a lame duck, the Ramaphosa faction’s power in the ANC’s parliamentary caucus is likely to grow substantially. Parliament, or rather the ANC caucus, has taken on a whole new role in fighting corruption and keeping the executive in check in recent months and won’t relinquish that role. Zuma and his supporters know that if they go against Ramaphosa or refuse to relinquish power, Parliament will deal with them. A motion of no confidence or impeachment looms. Don’t forget that the criminal charges against Zuma are likely to be reinstated early next year and that the recent revelation that he had fraudulently received a huge salary from a private benefactor for four months after he became president will likely lead to more criminal charges. In any case, the momentum of overwhelming public resistance and civil society activism against state capture and corruption will not wane in months to come, despite the fact that it wasn’t reflected in the ANC branches’ choices yesterday. Ramaphosa’s best argument why his party should walk with him is the prospect that the ANC will most definitely get less that 50 percent of the vote in 2019 if it doesn’t transform itself. But he will have to pay close attention to win over the ANC structures in KwaZulu-Natal and angry leaders like Sihle Zikalala. The strongest ANC province now has no representative in the top six and the resentment is palpable. Appointing Nkosazana Dlamini-Zuma and Zweli Mkhize to his Cabinet once he takes over as president will go some way to deal with that. I think we are about to see another side of Cyril Ramaphosa than the quiet, respectful party loyalist we have seen since 2012. That strategy made sure he remained deputy president and he needed that to be able to make it to the presidency. I have witnessed the steely, almost ruthless, side of Ramaphosa on more than one occasion. In 1988 he and I were invited to talk to the board of the then still mighty Anglo American on the latest political trends in the country. I watched in awe as Ramaphosa, at that time as trade union leader Anglo’s fiercest enemy, took the powerful white men in the palm of his hand, insult them, praise them and joke with them, ending with a standing ovation. It was very impressive. Earlier, as a reporter on the Financial Mail, I witnessed his supreme political skills as he masterminded the “unity talks” among trade union leaderships to form Cosatu in November 1985. Ask Roelf Meyer about Ramaphosa’s political talents, he experienced them from up close. Meyer tellingly said this morning his old negotiations partner “certainly had the backbone” to deal with his many challenges. My old friends in Northern Ireland, where I covered the violent conflict for a few months in the 1980s, talk about Ramaphosa’s role (with former Finnish president Martti Ahtisaari) in decommissioning IRA arms stockpiles and promoting a peace deal with great admiration. If half or slightly more of the ANC’s national executive committee to be elected today are in the Ramaphosa camp, I’m convinced we will see swift action early in 2018. The traders who have boosted the Rand since yesterday probably got it right this time. 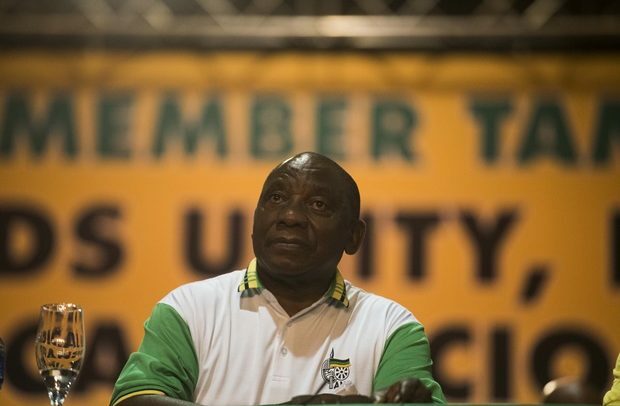 Ramaphosa’s election was indeed a critical turning point for South Africa, despite the mixed messages sent by the ANC delegates.